The third group, the Celts, are of particular interest in the scope of this article. It is probable that the Belgae were also a Celtic people – perhaps one with strong Germanic connections – and that the Aquitani were a people similar to the Basques (and therefore speakers of a non-Indo-European language); the largest part of what is now France was the home to the Gauls, a Celtic people who spoke a Celtic language. The Indo-Europeans arrived in Europe during the second millennium BC. In time they divided into separate sub-groups defined by cultural characteristics and common languages or sets of dialects. Such groups include the Illyrians, the Balts, the Slavs and so on. The Indo-European people known to us as the Celts appear in the archaeological record from approximately 500 BC. Their pale of settlement covered a large region of Europe and included Gaul (i.e. France), Great Britain and Ireland. Julius Caesar conquered Gaul. The process was completed by 52 BC. Roman rule over Gaul ended terminally in 486 (AD), Gaul became France ruled by the Merovingian dynasty. The Merovingians were Franks, a Germanic people; the name “France” means “Land of the Franks”. Under Roman rule Latin had displaced the Gaulish language; under Merovingian rule a new language that was the forerunner of French harried it to extinction. There were Celts in Britain too, but Britain was not conquered by Julius Caesar. An area equivalent to today’s England, Cornwall and Wales was conquered in 43 AD under the emperor Claudius and incorporated into the Roman Empire. Roman rule in southern Britain ended in 410 AD and therefore lasted a total of 367 years; 171 years less than it did in Gaul. A handy illustration of this rule can be seen in the word for number five. In the Goidelic languages it is this: Irish: cúig; Scottish Gaelic: còig; Manx: queig; and in the Brythonic ones: Welsh: pump; Breton: pemp; Cornish: pymp. I won’t labour this point any more, other than to point out another fun example: the “Ken” in “Kennedy” and the “Pen” in “Le Pen” are cognates that follow the same rule. They both mean “head”. It may be that the relatively shorter Roman occupation of southern Britain or its greater remoteness helped preserve its Celtic languages. Regardless, the Britons, or the British élite, learned to speak Latin just as happened in Gaul, and became Christians just as the Gauls did. As in Gaul, waning Roman power and attacks from neighbouring barbarians (in this case Gaels from Hibernia, Picts from Caledonia and Germanic tribes from across the North Sea) led to a Roman withdrawal and was followed, in a sequence that is the subject of great historical controversy, by the establishment of new kingdoms in the area that is now England. The British Celts – or at least the Celtic-ruled polities in Britain – were squeezed into the North, known as the “Hen Ogledd” (“Old North”) in Welsh (for a relatively short time, as the Hen Ogledd kingdoms were wiped out after the Battle of Catraeth in 600 AD), and into the West: Devon, Cornwall and Wales. Under such circumstances, one may well want to leave. Many did: they migrated to Brittany. They established there petty kingdoms that now bear the names of the places they had left behind: Domnonée (Devon); Cornouaille (Cornwall); and Léon (Caerleon, in south Wales). There had already been some settlement of Britons across the sea from Cornwall, and numbers increased as Roman rule came to an end. The end result of this process was the establishment of a new, British kingdom outside of Britain proper. Amazingly, more than 1500 years later, these ancient British refugees still have their own language. In article published this year (https://www.francebleu.fr/infos/faits-divers-justice/le-nombre-de-locuteurs-bretonnants-est-stable-mais-1538674396) one can read that there are 207,000 speakers of Breton, 140,000 of whom use the language at least once a week. Their average age is 70 years. After its initial establishment in the wake of the collapse of Roman Britain, Brittany retained its independence. The kingdoms established there were eventually unified in about 850 AD. Brittany retained its independence until 1532. The Breton language, while never official, remained the language of the majority in the west of the peninsula. 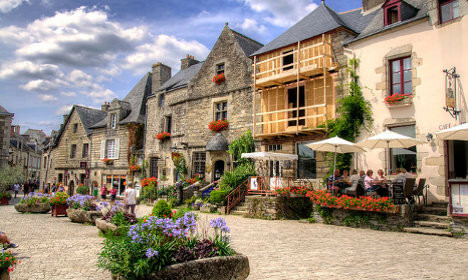 Breton remained a strong community language until after WWII; then it collapsed. Universal education, combined with anti-Breton measures enforced by the French state and the pernicious influence of modern communications media dealt blows to the language from which it has not recovered. That’s why your average “brittophone” is aged 70. Breton has become something of a cause célèbre among certain circles but it has entered the same kind of death spiral as so many other languages have. Its incredible survival story may well be coming to an end. But let’s hope not. In the meantime: Merry Christmas! Or, as they say in Breton, Nedeleg Laouen!